THE TOWN OF NEWINGTON RESIDENTS DEPLORE THE CANADIAN GEESE INVASION TOO! Why is the New Britain’s common council radical & socialistic leadership so distanced from what the general public wants; and that is to regain the use of the public parks. Maybe it is time for the “Democratic Zealots” to work in finding a solution rather than continuing the blame game they are so accustomed too. The city residents wants to get rid of the continued after leavings; and the possibility of our youth contracting the Asian flu along with other diseases. During the CPOA membership meeting held Thursday Evening with Rep. John Geragosian, the Co-Chair of the Appropriations committee, Rep. Geragosian made his presentation regarding the state budget and how it impacts New Britain Taxpayers. 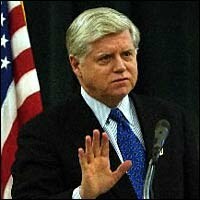 He forecasted budget deficits of $4 billion for 2010 and $4.7 billion for 2011. He used multiple pie charts to show us where the legislature is spending our tax monies. But when it came time for the membership to present their questions to him he avoided answering directly but kept referring to his state issues in his presentation. When asked why the state delagation made state funding available for schools in Waterbury, Hartford, New Haven, & New London but nothing for New Britain, his answer was simply that the other towns had “more problems“. He was also asked if he would, as a city resident, call the New Britain Board of Education to put pressure on their releasing their current line by line budget information that the local Council membership are not able to obtain from them. Again he evaded answering this question by simply stating that the state is very open with their reporting and suggested going to the state Freedom of Information Commission in furthering the group’s efforts to obtain the records. The FOI would only obtain the prior year’s information since the current information is not available to the public because it is in a draft document! Unfortunately, we elected our state delegation to first represent the needs of New Britain and not those of other towns and cities to be the primary recipients; but they are ignoring our city’s educational needs. Unfortunately and sadly, question after question asked by our membership that attended this meeting, were deflected by the appropriations co-chairman. I must also commend the membership for being respectful throughout the meeting by not showing any resentment for the avoided answers. This is totally ridiculous. The reputations of our schools should be built on the work that they do with students. At this point in time what do we have? By whatever standards that exist, New Britain Schools have not performed well at all. It appears that the only statistics in which they seem to excel are not academic. Our schools excel in lack of respect for others in many categories, discipline problems and substandard test scores. Doris Kurtz and her leading administrators excel only in asking for exorbitant budgets which, for ten years since she arrived in NB, are opaque. 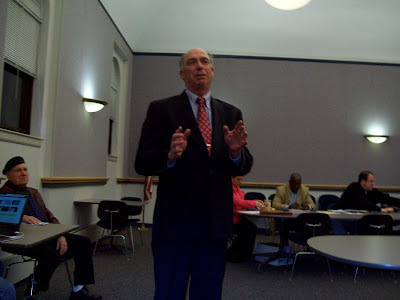 New Britain school budgets are a "black hole" of waste and incompetence. Bloated budgets and payrolls and among the lowest standardized test scores in the state. Sad, sad, sad! The taxpayers should revolt against this incompetence. 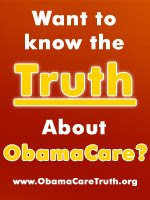 Dr. Kurtz has no answers nor solutions to offer, just, give us more money! For what? I will not vote for one additional penny for the schools. The person manning the rudder of the New Britain Schools has failed, pure and simple! No slick videos produced by someone or some, "FOR PROFIT" firm is going to change that. Our BOE too has no answers - a one-sided, purely political, totally partisan and self serving Board is as useful as mammary glands on a bull. VIDEOS! What a sorry misuse of taxpayer money! Around Town: Golden Hurricanes march for 75 years - The New Britain Herald (newbritainherald.com)---Celebration to be held on June 6th. Several pundits have described the felonies alleged to have been committed in this White House as rising to a much higher level than Watergate, but why is the media ignoring the situation? Click the headline above to read the entire story. 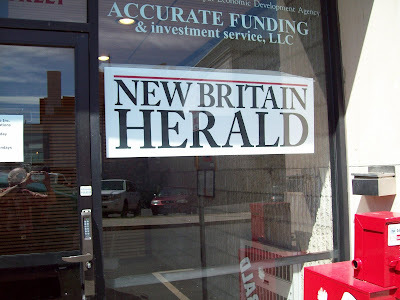 The new Britain Herald’s editorial, that appeared today, “Our View” citing Canadian Geese? Harass them; don’t kill them. Unfortunately, with this editorial the Herald has shown a disdain towards the health and general well being for the city’s children who are forced to be exposed to the unhealthy conditions that the after leavings present, such as the Asian flu, while playing their desired sports in all our parks. The Parks and Recreation director did explain that they used all methods known to man in attempting to rid of the geese from our parks. He even went so far as to explain that they even resorted using guns with blanks to no avail. The state DEP along with the U. S. Department of Agriculture evaluated the city’s problem and came up with a recommendation to use a vendor to round up some, not all, of the geese that are plaguing our parks. Therefore, it is quite evident that the Herald continues to side with the Democratic control of the city’s common council and their radical socialistic stance of knowing what is best for the residents and ignoring what the residents want. Somehow, they were elected to represent our residents but they know best by forcing their radical view points down the resident’s throats. It is hoped that the Herald should understand that our residents want to regain the use of our recreational facilities without the interference of the Herald’s Our View Stance. What Is It About the Sestak Mess That Sounds So Familiar? Conflicts of Interest Continues with Alderman Catanzaro! Past reports of his ethical lapses have been reported on this blog and apparently to no avail. 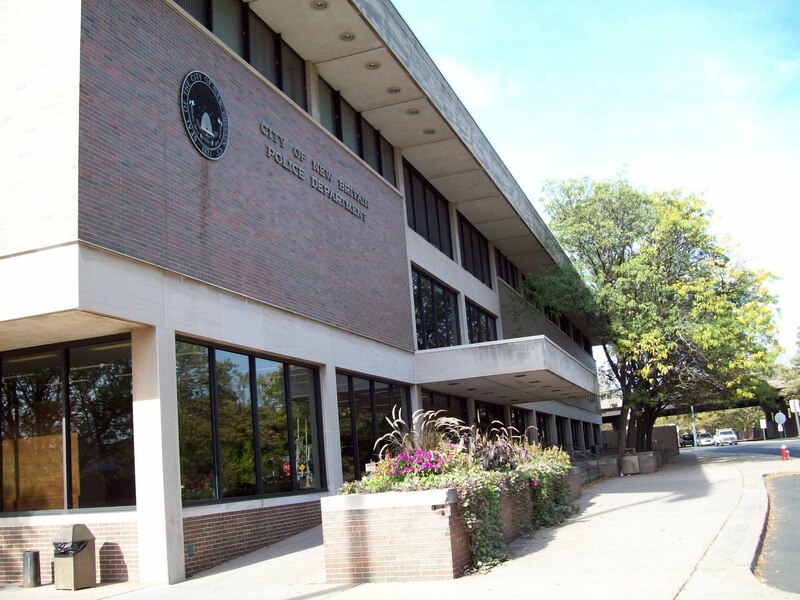 During Wednesday's Common Council Meeting the Alderman's appearance of conflicts resurfaced. The fact that he is an employee of the Parks and Recreation department creates an appearance of conflicts on three issues affecting his own department when the Alderman casted votes on those matters. The first was an issue regarding the purchase of an Exmark Lazer Mower for the Fairview Cemetery which is under the Parks and Recreation Department. Much discussion occurred with the Democratic side of the aisle noting that we have a 1.5 million dollar budget short fall and they saw difficulty spending $10,000 for this Mower. The Director pointed out that the existing mower was constantly in the repair shop and needs replacing. It was reported that this lazer mower can maneuver around the un-even stones because the cemetery was built without engineering design two hundred years ago. Much was said to not allow this expenditure with Alderman Mark Bernacki pointing out that the funds were approved by the council when they approved the annual budget and that the Director was merely attempting to get the council's approval to spend the money. The second issue was the request by the parks and recreation department to approve the purchase for liquid propane gas for heating fuel and hot water heaters. The third issue of appearance of conflict was with the engineering services for the designing for the Veteran's Stadium Grandstand structural remediation and partial roof replacement. It is a complete mystery why this high vote getter has to resort to these tactics by not removing himself from the council floor, when these type of resolutions are discussed by the council, in order to eliminate any appearance of a conflict. Democratic Controlled Council Voted Against Protecting our Children's Health! The Parks and Recreation Department requested the council to provide the funds that have been allocated by the approved Council Budget in order to reduce the population of geese in order to reduce the waste products within New Britain Parks effecting the heavy usage by young children for little league, soccer, and other enjoyments use of the parks. The State Department of Envoirmental protection and the U. S. Department of Agriculture who have jointly proposed a coordinated plan of action to be undertaken by the City with a round up plan. This action has to take place during the month of June during the geese molting season. After debating the issue for nearly an hour long with the democrats arguing that the city has a budget short fall. The Director did point out that the droppings are a source for the Asian flu therefore the reduction plan would help reduce this health problem to the children who slip and slide, while playing their desired sports, into the adverse product left behind in the parks by the geese. He also pointed out to the council members that the money was available in the park maintenance; account a sum of $6,000.00. These radical democrats would like to tell you what is best for your children and you have no say in protecting your children; because they know best! I hope that the parents will recall the democratic no vote for protecting the city's children come the next election day. Alderman Salvio on the Blumenthal Issue!!! In Sunday's Herald, 5/23/10, The Herald scored a trifecta. Editor Jim Smith and columnists, Chris Powell and Kathleen Parker all weighed in on the Blumenthal, Vietnam lie. 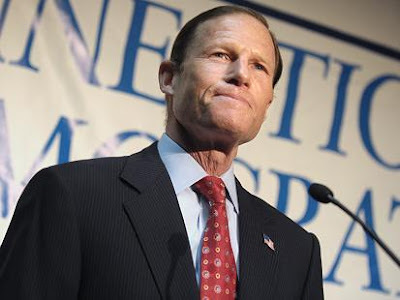 In three different ways, all three decried the attempts by AG Richard Blumenthal to pooh pooh his gaffe/lie about whether he served in Viet Nam with the U. S. Marines. Pure and simple, Blumey tried to pass himself off as having served with the Marines in Viet Nam. Again, pure and simple, it was a lie. Not one of the writers attempted to portray the situation as an "all right" act by Blumenthal. All three columns were objective and avoided finger pointing. Nonetheless, all three characterized the situation as less than acceptable behavior by Blumenthal. Why is it so difficult for some to say. "I'm sorry?" Kathleen Parker’s final comment was the most interesting. 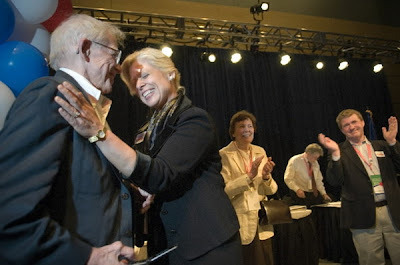 Then, following the Democrat State Convention, Blumenthal issued a “coerced’ apology. Too late, too bad, too phony! According to the report, the suspect "just laughed, slurring that he was going to go back to 'my country' Mexico. 'Nothing is going to happen to me, man.'" Though the suspect is being held after his blood alcohol content registered at .25, Massachusetts State Police spokesman David Procopio told FoxNews.com that state policy prohibits police from looking into the suspect's immigration status. That's after Massachusetts Gov. Deval Patrick rescinded an order three years ago by his predecessor Mitt Romney that empowered state police to enforce immigration law. Personal Liberty Digest » Obama The Hitman: First A Cleric, Who’s Next? Representative Geragosian (D- New Britain), Chairman of the Appropriations Committee, has agreed to speak to CPOA members about the State of Connecticut budget and how it impacts taxpayers of the City of New Britain. This is CPOA’s first quarterly meeting featuring a guest speaker. Please come and hear how the State’s actions affect New Britain and ask Representative Geragosian pertinent questions about items like property taxes, unfounded mandates, etc. We request those CPOA members with email addresses kindly alert us to them in order we communicate with you in a timely manner. Email CPOANB@GMAIL.COM and put your name on the subject line to register for our email alerts. Please email your $10 if you have (not already) to PO Box 2312, New Britain, CT 06050. Thank You. 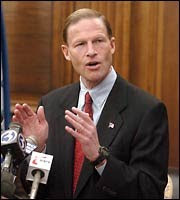 Blumenthal: Our Lawsuits Create Jobs? Welcomed by Businesses? Republicans recently nominated Cris Carillo as their candidate for the office of State Representative for the 24th district, which includes parts of both New Britain and Newington. Carillo, 30, is a resident of New Britain and owner of KeystoneBankCard.com. Carillo also has the support of House Republican Leader Larry Cafero. “Cris has the energy and ability to run a strong campaign. He understands the Common Sense Principles that our state needs to embrace as we face the state budget deficits that are in our future. As a small businessman, Cris has seen the devastating affects of the recession and will bring real-world experience to the Capitol,” said Cafero. 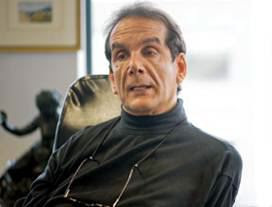 Carillo is a lifelong resident of Connecticut. His parents currently reside in Avon. He has been a property owner in New Britain for over four years. Carillo worked for ESPN for several years. In 2008, he started KeystoneBankCard.com where he is self-employed. Carillo is currently a member of the New Britain Lions Club and has been a member of UNICO. He is an Eagle Scout. 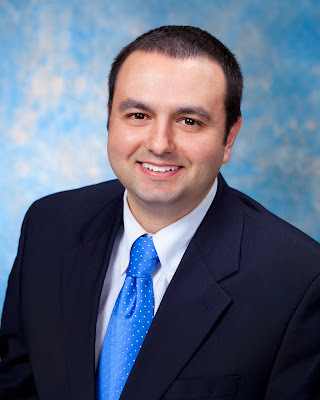 Carillo earned a Bachelors of Science in economics from the University of Connecticut in 2002, where he was the founder & president of the UConn Real Estate Society. To this day, I've yet to hear any stories of war from him, or, for that matter, from any of the men in my family, all of them veterans of various conflicts. A few scattered pictures of tough boys sporting knives and guns occasionally find their way to the top of a shoe box, but there are no videos or journals, no displays of Purple Hearts. "There is nothing that binds Marines together like combat and, if you missed it, I can understand that he [Blumenthal] may have actually convinced himself he was there," my brother wrote in an e-mail. "But those who served in combat consider Marines who did not the same brothers, regardless. We are a team and those in the rear are just as important as those on the line." Click the headline for the printed story and a video report. Nicholas Mercier, Commissioner, Board of Finance and Taxation, New Britain speaks Out. Citing the recent budget hearing held at the New Britain High school were several hundred parents and teachers out to express their concern over the Mayor's proposed budget. 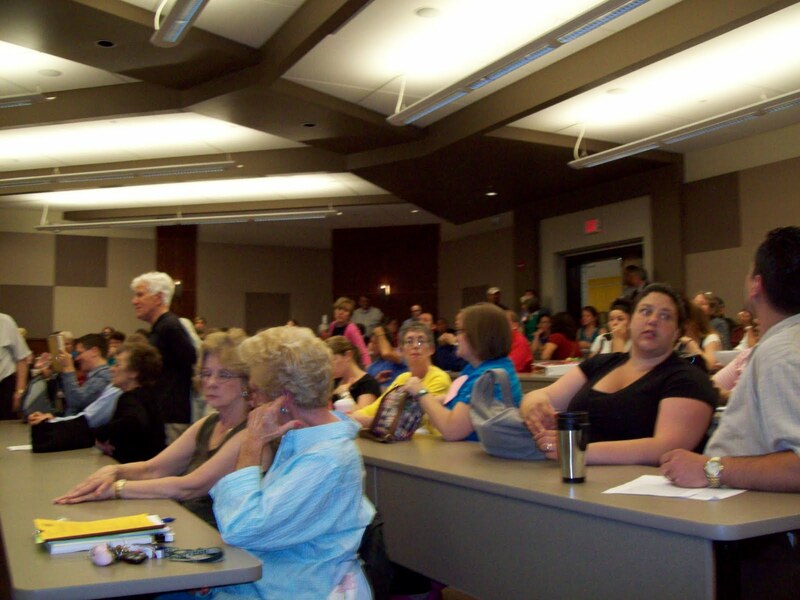 With the school officials threatening a possible elimination of over two hundred positions citing that the parents would have better spent their time with their attending the Board of Education meeting to state their concerns. Since little information was made available by the school Board's Superintendant's request for the $131,000,000 new annual budget which included a $13,000,000 increase which was far too much for the city to bear. The commission decided on a three million cut to the request. The Administration still hasn't provided our commission a full budget detail report and is so protective of their budget activities that even board members are not given these documents during budget deliberation by its membership. We should find and reduce waste, spending the wasted money where it matters------on our children. New Britain Republican Town Committee Cites Over budget By The Board Of Education! New Britain Town Committee Cites Over budget By The Board Of Eductaion! There has been a great deal of press lately over the state of the budget that the Mayor has proposed for education. Members of the central administration and the Board of Education are threatening that hundreds of teachers may need to be laid off in order to close the budget gap. While it is impossible to know the true figures, the central office does not even provide the Board of Education with a detailed accounting of their finances, we can glean just how much potential waste exists in the school budget. • The self insurance fund was funded in 2009-2010 at roughly $10 million. The request for 2010-2011 is over $14 million, an increase of $4 million. • Library books was funded at a level of $9200 in 2009-2010. The request for 2010-2011 was $19,200, over twice as much. • Requests for Data Processing funding increased from $171,500 to $208,625, an increase of just under $40,000. • Fuel and Oil requests increased from $600,800 to $654,535, an increase of over $50,000. The worst part about these increases is that there is no way for the Board of Education, the Board of Finance and Taxation, the Mayor, or the Common Council to know whether or not these budget amounts are justified or whether or not these increases are justified. That is because the central administration keeps a tight lid on their records to avoid oversight and scrutiny. When every other department goes before the Board of Finance and Taxation the Board can see their past expenditures, how much they spent each year on a line item for the past five years. The Board can also pull up exact records of how much has been spent year to date from any account, what the money has been spent on, and what the outstanding balances are on any open purchase orders. By refusing to provide accurate and timely information the central administration for the school district is in short asking for blind trust from the tax payers and from the Common Council. Considering the level of oversight that every other department must go through it is alarming that over half of the municipal budget goes to the Board of Education with little to no oversight. It is easy to provide lip service to the value of education. It takes much more political willpower to actually take a stand for accountability and demand a fair display of how the central administration is spending the millions of dollars they already receive. Until there is an open process by which the Board of Education and the central administration of the school system demonstrate a real need for the massive increases in funding they request it is the duty of the Common Council to remain skeptical. The Common Council should demand transparency before they consider returning any funding to the education budget. In the breakneck speed changes fired off daily from the Obama regime, we now know why they have always touted President BHO as “The Messiah”. It now becomes clear that it had much less to do with protocol and more to do with competition when Obama wanted the cross removed from view when he addressed University of Notre Dame and Georgetown University. The Pocket Messiah is stepping out of the shadows into your church. Hallelujah, for blowing the whistle, Glenn Beck. “Your church is being attacked through a faith-based initiative headed up by Barack Obama’s administration,” Beck said on his FoxNews program last night. It’s called the merging the EPA with churches. Jesus is out and Gaia Global Warming is in. While we were waiting to see the Messiah walk on water, he was stealing it. UN Poster Boy and Obama mentor Maurice Strong is on the public record for predicting that water will have to be rationed by armed guards as soon as 2031. The City of New Britain Budget Hearing Fiasco! Minority Leader Alderman Louis Salvio was correct when stating that he didn’t want to hear from out of town speakers, He was referring to the individuals that may be New Britain school teachers but live out of town and do not pay city taxes. However, the Majority leader was quick to admonish the alderman for his comment and appeared to be grand standing to the teachers that were their to push their agenda. With over 400 attendees only three of the speakers were from the general public. Mr. Michael Foran the New Britain High School Principal cited that the school is off probation but if the budget is cut the state may put us back into the probation status. With some four hundred teachers in attendance with mostly not city taxpayers; shores up Alderman Salvio’s original opening statement. The main theme of all the school personnel was to push for the return of the proposed three million dollars cut for the school budget by the Mayor. Mrs. Ann Mikulak a former president of the CPOA a taxpayers watchdog organization asked “Why do we continue to pay some $40,000 in rent for the Probate Court? I spoke to the people at city hall and asked why don’t we make room for the Court in the new police station? They replied it has already been decided. She continued her remarks by saying how can they say that when they haven’t even put a shovel into the ground yet! Mr. Tony DePietro also with the CPOA made his point by pointing out that many of the seniors received no raises that are on social security and cannot afford the proposed increase. The biggest question of all is the fact that the overall school enrollment has decreased 600 students that used to cost the city $11,000 per student saving the school board administration a total sum of $6,600,000 dollars annually. What happen to that large sum of money? Why the big push for more money by the board of education? I trust that the Common Council Members will find the answer as to where the money disappeared too! Click the link above for the printed story or to watch the video of WFSB news coverage on this important story. 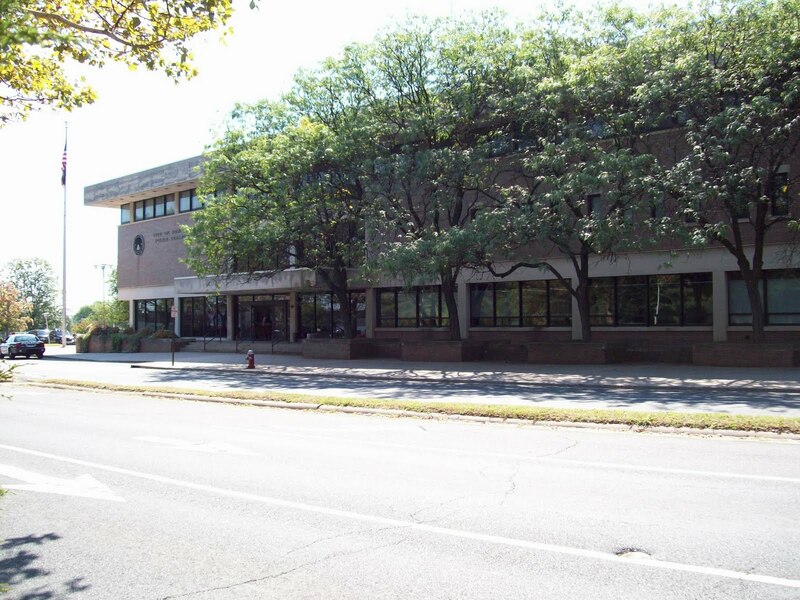 The Common Council and the Board of Education members will be holding a Budget Hearing in the New Britain High School Lecture Hall at 6 P. M. tonight. Hopefully, many of our membership will be there to voice our group's concerns over the proposed Seven Per Cent tax increase. Please be there and Speak Up. Aldermen Salvio and Catanzaro Votes No!!! Alderman Salvio recalling his days spent at the New Britain Senior High School, in the early fifties, stating I was taught that “ours [in the U.S.A.] is a government of laws.” I didn’t appreciate the meaning of that statement then but, was always aware that I had heard it; but, as the years went by and I became somewhat involved in the government of our City, I have become more appreciative or the statement’s meaning. Realistically, at times it is annoying but it makes me think. We live with many adages: “the squeaky wheel gets the grease”; ” it’s not what you know, it’s who you know”, etc. People have laws to which they must adhere, federal, state and local laws. These “laws” are supposed to apply equally to all citizens. Locally we have ordinances that are our “organic” laws. The folks who enact these laws are our Common Council members: aldermen/alderwomen. Our City Departments//Agencies, etc., enforce (or are supposed to) these ordinances. Now, back to who you know vs. what you know. At the Common Council meeting on Wed., 5/12/10, both petitions came up for a vote. The first petitioner had no problems though he had no one to speak in his behalf. 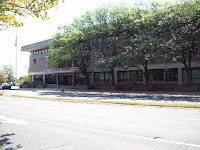 The second, connected petitioner had many local civic and religious supporters and, despite an objective, yet negative report from the City’s, Plan Department, was also granted a favorable vote. Only Aldermen Lou Salvio and Paul Catanzaro voted against granting the license to this second petitioner. The vote was, eleven yes, two no! Go figure! Is it who you know?
" Mr. Smith, it is you who are "clueless", as you say as to what is being done in New Britain with regard to downtown redevelopment. What little I know about Bristol is provided by a few relatives that live there, a high school classmate that became Mayor there and ESPN. You use pejorative terms such as, "clueless", " an odd little sentence" in our ordinances to demean the City. While you are protected by free speech and freedom of the press arguments, it is you who appears clueless., Nonetheless, you should avoid being bigoted when someone disagrees with your point of view. The New Britain Common Council has been briefed every step of the way regarding downtown redevelopment. The Master Developer has pledged to use local businesses and contractors whenever possible; Downes Construction and Kaestle Boos Architects have been cited by the developer to be the firms of choice. NOTHING has been hidden from public scrutiny. Mr Smith: if you don't agree with our ordinances, work to change them. In the meantime, demeaning the efforts of the City of NB is counterproductive. I don't think you are really interested in that point of view, but rather, only in throwing stones and selling newspapers. Your reporters and you are constantly looking for something to pin on the current NB Administration. Try being happy for a change! " Editor's Note: This is Alderman Salvio's response to a 5/15/2010 editorial authored by New Britain Herald Executive Editor James H. Smith. Alderman Salvio's references to "Mr. Smith" has caused some confusion among my readers that he might be referring to me, when in fact he is referring to the Herald Editor. CITY OF NEW BRITAIN BUDGET PUBLIC HEARING! Budget Hearing Monday at 6:00 pm at the Lecture Hall at the High School. Public is invited to make comments. PLEASE BRING ALL YOUR REFUNDABLE CANS AND BOTTLES TO THE CONCESSION STAND AT THE A. W. STANLEY PARK. COLLECTIONS FROM 10 AM TO 5 PM. PLEASE SUPPORT OUR LITTLE LEAGUE!!!! 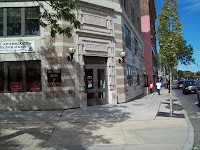 New Britain Police Station Story Continues!!!!! One of the most interesting moments of the Common Council meeting held on 5-12-10 was when Mr. McDonald of the Downes Construction Company announced that the design engineers, Kaestle Boos Associates, who has designed many police stations throughout our state has been the firm selected to draw up the blue prints stating that we are a team and we work well together. Alderman Trueworhty question why their wasn't an RFP bidding procedure? With the Mayor responding that design work doesn't require an RFP'S. Then the Majority leader, Alderman Phil Sherwood, jump in with his peppering many question directed to Mr. McDonald and finally referring to the "team" connection of Downes and Kaestle Boos is making me "very uncomfortable". After the pompous display for the audience and the press both Aldermen Sherwood and Trueworhty voted in granting their approvals of the architectural selection. City of New Britain Budget Hearing! PLAINVILLE: Men Charged in House Party Assault: "The Courant"
NEWINGTON, May 11 – Republicans of the 24th Assembly District Tuesday night nominated Cris Carillo as their candidate for the office of State Representative. The 24th district includes parts of both New Britain and Newington. Cris was born in New Britain. He has been a property owner in New Britain for over four years. Cris, after working at ESPN for several years, started his own business in 2008, KeystoneBankCard.com, where he is self-employed today. Cris is currently a member of the Lions Club and has been a member of UNICO. He is an Eagle Scout. 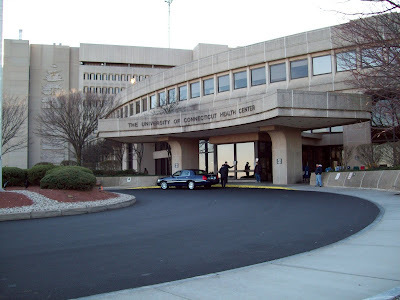 Cris obtained a Bachelors’ of Science from the University of Connecticut in 2002, where he was the founder & president of the UConn Real Estate Society. 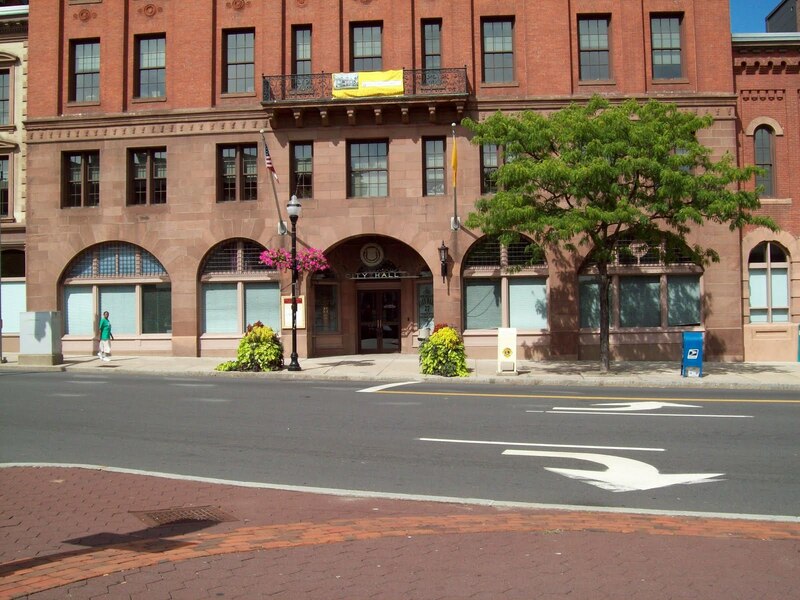 The Common Council of New Britain will meet this Wednesday. Alderman Mark Bernacki Speaks Out On Small Business Problems In Conn.
Small businesses have led Connecticut and our nation out of economic downturns, depressions, and recessions. Small businesses account for between 70-75% of our entire economy and employ 9 or less employees. Small business owners are active in communities, like New Britain, raise their families here, promote volunteerism, and contribute to the fabric of our community. With 2010 being an election season there is great bluster and fanfare coming from the Washington and Hartford claiming they love small business. Yet few know how to help us grow and prosper. Washington and Hartford talk about wanting to help small business yet promote policies, regulations, and increase taxes that damage the job creation engines in every community. Remember “too big to fail”? The President’s supposed jobs stimulus summit included every entity except one, small business. I guess we really were “too small to matter”. 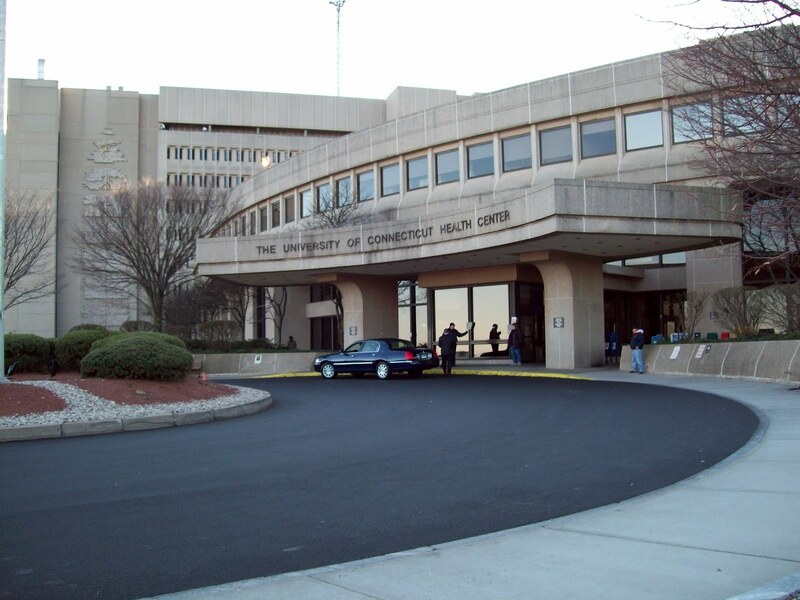 There are many factors in the high price of doing business in Connecticut and New Britain. Since the implementation of the state income tax Connecticut has seen ZERO net private sector job growth. That’s ZERO growth in almost 20 years. The only sector that grew was government. Income taxes take money out the pockets of not only businesses but also their employees. 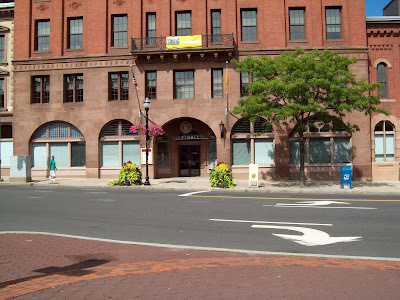 New Britain is not only in competition with towns in Connecticut, but regionally, nationally and internationally. We must compete to keep the businesses we have and attract new ones. We need to incubate, not exterminate its local and small businesses. Businesses are concerned about the impact of long term budget deficits and record spending levels. Record debt and increased taxes at all levels are the last thing Connecticut and New Britain need in these tough economic times. Long term spending cuts must be implemented. New Britain has been able to hold the line on taxes for six straight years. This has helped us compete with our neighbors. 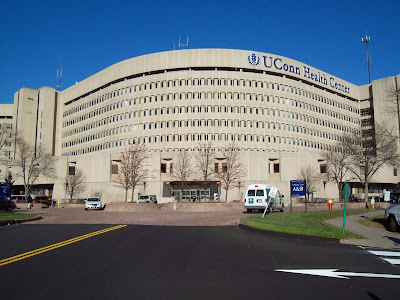 Connecticut now must do the same to compete regionally. Businesses will not hire, grow or prosper with economic and political uncertainty. Joe the Plumber was told to work harder and give his hard earned income to the government to “spread the wealth” to others. Businesses do “spread the wealth” by creating and providing jobs. Private sector job creation IS the “spread the wealth” solution. Not government intervention. The key to turning around the economy is private sector jobs. History has proven time and time again that lower taxes, reduced government spending and reduced burdensome regulations provide the true stimulus to economic growth. Small businesses don’t need more taxes. They need less. Forcing businesses to offer benefits they cannot afford will cost Connecticut and New Britain jobs and revenue and inhibit small businesses from growing. Mandates and higher taxes are bad ideas any time, but are particularly destructive in the current economic environment. One of the largest unfunded state mandates that impacts New Britain is binding arbitration for government worker contracts. This system ensures automatic cost of living increases with little, if any, downward movement in wages, health care costs and pensions. Since employee costs are New Britain’s single highest cost this has the biggest impact on New Britain’s property taxes. Small businesses in Connecticut need immediate, meaningful tax relief to help turn the State’s economy around. Lower tax rates help businesses keep more of their money to reinvest, grow their businesses and hire more people. New Britain residents need jobs. Lower income tax rates, state sales tax rates, property tax rates, electric and gas tax rates, insurance rates, college tuition, help families keep more of their hard earned money and help build better communities in New Britain and Connecticut. This upcoming Saturday the New Britain Little League will be holding a can and bottle drive. Please bring all your refundable cans and bottles to the concession stand at A. W. Stanley Park. They will be collecting from 10am-5pm. Please Turn out to support our Little League. The Secretary of State Primary Races! With the recent court ruling regarding Secretary of State Susan Bysiewicz ability to run for the Attorney General position; has placed for primary candidates vying for her vacated seat with Gerry Garcia-D, Jerry Farrell, Jr., Michael DeRosa, Green Party, Denise Merrill-D.
Ms. Merrill, a current State Representative, stated that she supports felons to be able to vote while on probation and went on to say that the courts were too harsh with their handling of the Pettit family murderers--which indicates her being an ultra socialist radical with her view point. Mr. Garcia stated the reason for his candidacy simply is because he feels that the Hispanics have no reason to come out to vote and in New Britain that is why O’Brien lost. The reality is that both tickets in New Britain had Hispanics on their tickets. Jerry Farrell, Jr. is currently the Consumer Protection Commissioner, an attorney, and has been involved with many of his hometown of Wallingford’s political and humane society organizations. Mr. Michael DeRosa a candidate with the Green Party has run as a candidate for various positions and is from Wethersfield Ct. He is a computer network specialist and also an editor for the Green Times. I wish them all a good luck with their new political hopes. Susan Bysiewicz Wins Court Suit! With a recent court decision Susan Bysiewicz-D will be allowed to run for the state’s Attorney General position in the democratic primary being opposed by former state Representative George Jepsen-D. However, an appeal of the court decision may materialize if the Republican State Chairman, Chris Healy, should decide to further the party’s efforts. The winner of the primary will face Martha Dean-R and Stephen Fournier of the Green Party. Rep. Chris Murphy’s Congressional Seat is in Jeopardy! With Justin Bernier, Mark Greenberg, and Senator Sam Caligiuri all vying for this democratic congressional seat even to the point with Mark Greenberg announcing that he his currently circulating petitions in the event he does not win the Republican nomination; he will primary. He guarantees that this will happen. He continued by stating that he supports to end big government because local government works better. He also supports to have the parents help their children with their homework which will tend to end the educational need for government intervention. When asked if he would be available for town hall meetings at a reasonable hour for the public to attend his reply was simple. Here is my cell phone number; call me anytime. I am always available; not like to guy that is in office now. This is a common complaint I hear from the voters as I travel throughout the district. It does appear that REP. MURPHY is in DEEP DEEP trouble! UPDATE 5/6/10: Journal Inquirer reports this girl has been located by police. 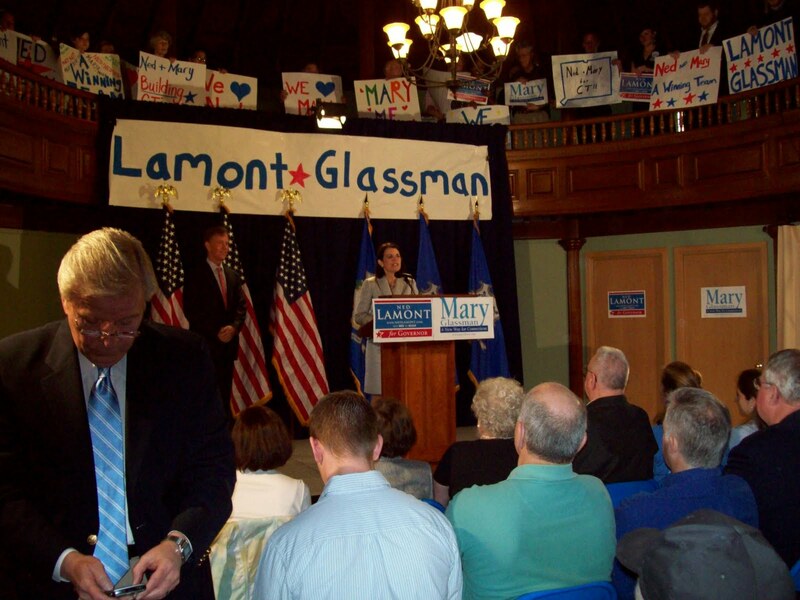 The Lamont- Glassman Ticket for Governor Announced @ Trinity On Main, New Britain Ct. 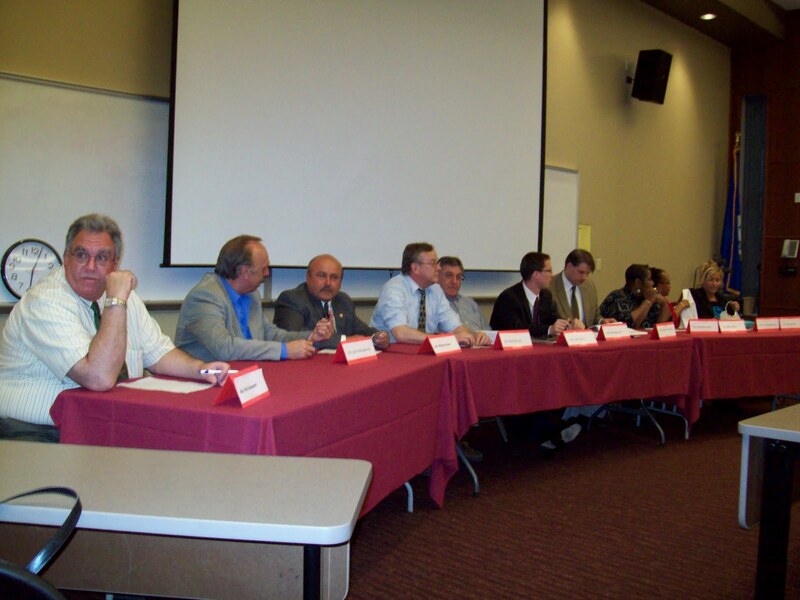 The introduction of the candidates was made by George Springer, Jr. of New Britain stating that he was very proud to support Ned, a professor at Central Connecticut University, calling it a team to win. Hopeful Ned Lamont cited his central Connecticut blueprint team to getting more jobs in Ct. He mentioned that there are 100,000 employers with less than 100 employees, we need to get them to hire at least one additional employee each. Mrs. Glassman proudly mentioned her young days of growing up in New Britain mentioning all the schools she attended as a youngster here in the city. She indicated her advantages to get a good education, here in the city, attending the University of Connecticut and graduating with a law degree. She further stated that education for our youth is slipping away these days and we can fix that for Connecticut. Mrs. Glassman cited that her a Ned can build a winning team together. In attendance were many of the ultra liberals from New Britain and throughout the state. * - IF YOU CROSS THE NORTH KOREAN BORDER ILLEGALLY YOU GET 12 YEARS HARD LABOR. * - IF YOU CROSS THE IRANIAN BORDER ILLEGALLY YOU ARE DETAINED INDEFINITELY. * - IF YOU CROSS THE AFGHAN BORDER ILLEGALLY, YOU GET SHOT. * - IF YOU CROSS THE SAUDI ARABIAN BORDER ILLEGALLY YOU WILL BE JAILED. * - IF YOU CROSS THE CHINESE BORDER ILLEGALLY YOU MAY NEVER BE HEARD FROM AGAIN. * - IF YOU CROSS THE VENEZUELAN BORDER ILLEGALLY YOU WILL BE BRANDED A SPY AND YOUR FATE WILL BE SEALED. * - IF YOU CROSS THE CUBAN BORDER ILLEGALLY YOU WILL BE THROWN INTO POLITICAL PRISON TO ROT. Subject: HB 1388 PASSED !! You just spent $20,300,000 to move members/supporters of Hamas, a terrorist organization, to the United States ; They get housing, food, the whole enchilada. The "presidential determination", which allows hundreds of thousands of Palestinians with ties to Hamas to resettle in the United States , was signed and appears in the Federal Register. Few on Capitol Hill, or in the media, took note that the order provides a free ticket replete with housing and food allowances to individuals who have dis played their overwhelming support to the Islamic Resistance Movement (Hamas) in the parliamentary election of January 2006. His first call to any head of state, as president, was to Mahmoud Abbas , leader of Fatah party in the Palestinian territory.